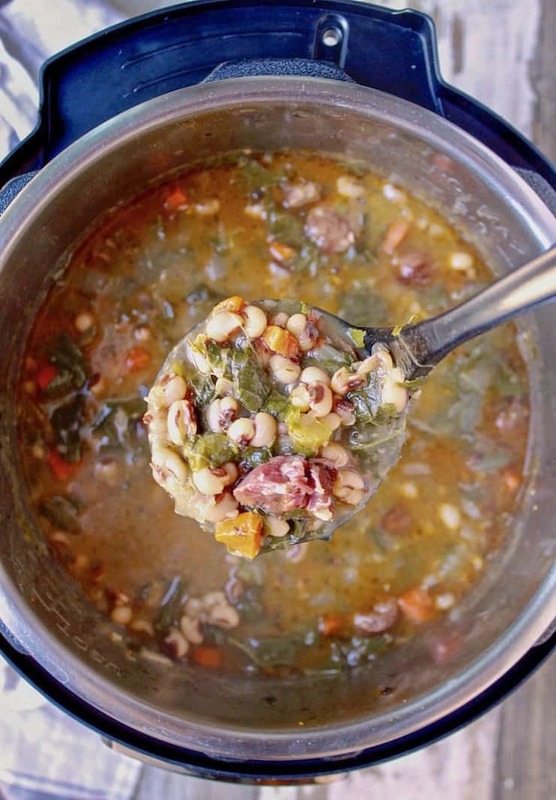 Instant Pot Black Eyed Pea Soup, with ham, andouille sausage and collard greens. No need to presoak the peas, they cook in under 30 minutes in the pressure cooker. 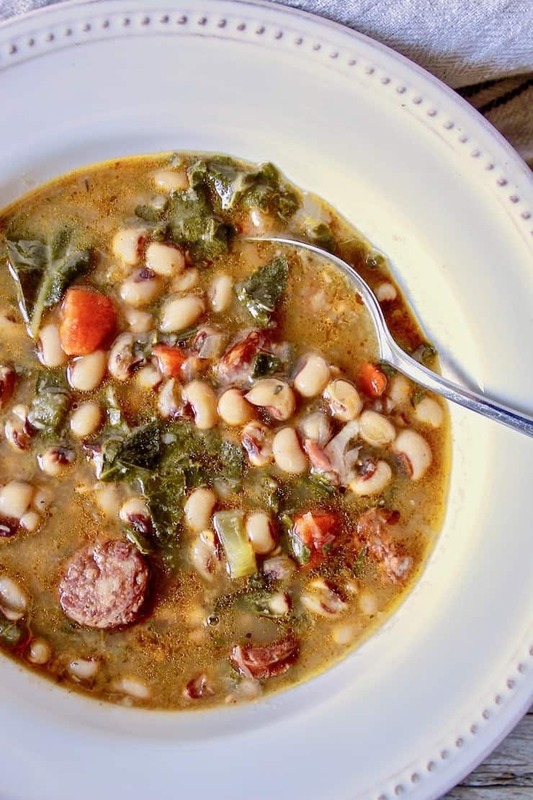 The perfect soup to ring in the New Year and a favorite soup to make all winter long. Happy New Year, three weeks late, but the sentiment is there. 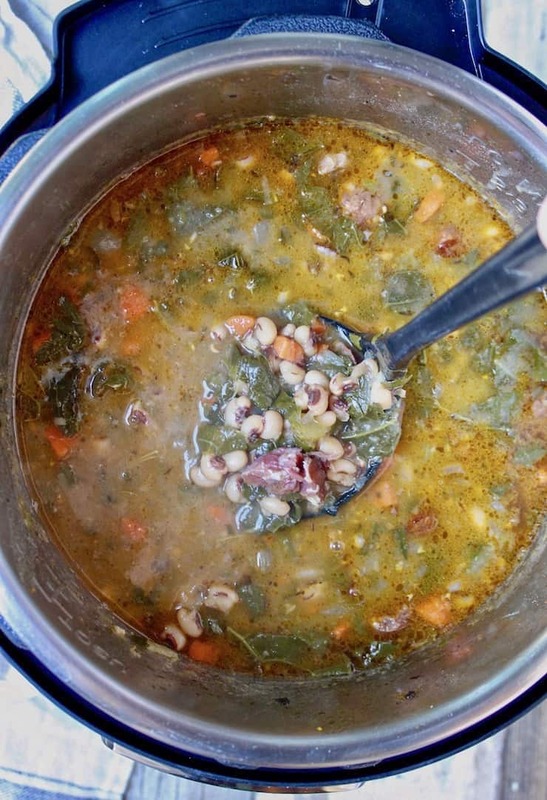 This black eyed pea soup in the Instant Pot is what I made for New Year’s Day and I meant to share it with you all a little sooner. But, hey, life gets in the way sometimes… right? Anyway, this is so good and New Year’s shouldn’t have a monopoly on it, enjoy it during all these cold winter months. 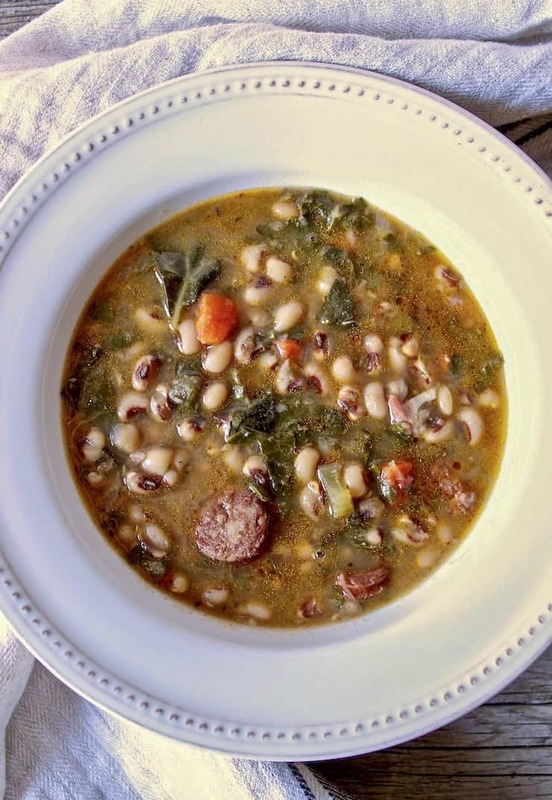 Tradition has it that the first food to be eaten on New Year’s Day should be black eyed peas for luck and prosperity. Adding greens makes them even luckier, the color of money. Collard greens are a traditional choice here, and I love collards. 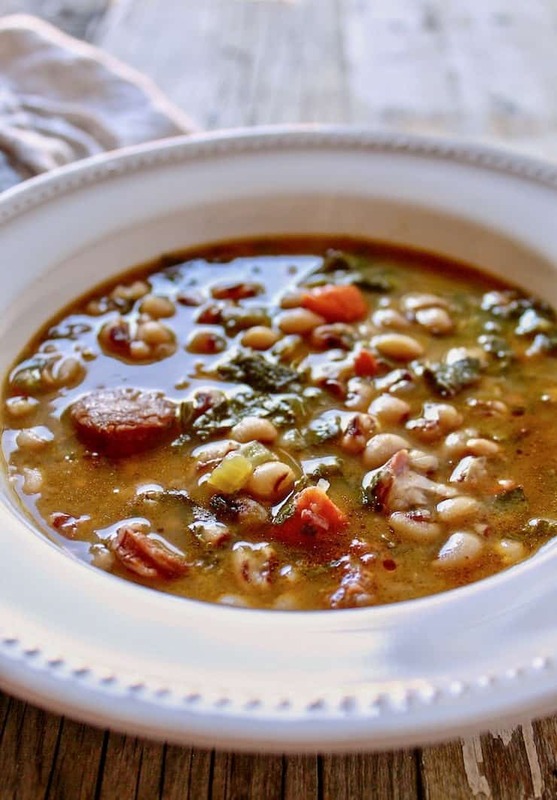 This soup has ham which flavors the broth and also some andouille sausage, both of which are frequent additions to black eyed peas. And it’s all flavored with some Cajun seasoning for good measure. Do I need to presoak black eyed peas for soup in the Instant Pot? Nope. There is no need to presoak the black eyed peas before pressure cooking. In fact, they cook fast in the Instant Pot, in about 15 to 20 minutes under high pressure. All you need to do is rinse them and put them in the insert, fast and easy. Soup is probably my favorite thing to make in the Instant Pot. You might also want to try White Bean and Ham Soup or Chicken Pho, both made easy in the pressure cooker. 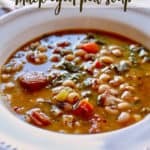 If you’ve tried this Blacked Eyed Pea Soup or any other recipe on the blog, then don’t forget to rate the recipe and let me know how yours turned out in the comments below ~ I love hearing from you! HUNGRY FOR MORE? Subscribe to The Hungry Bluebird Newsletter for a weekly email of new content and follow along on FACEBOOK, TWITTER, INSTAGRAM and PINTEREST. 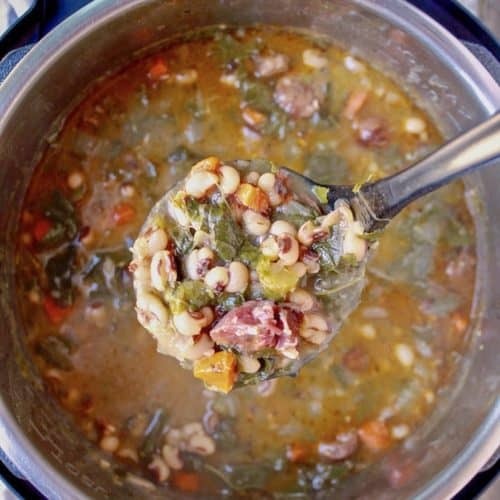 Easy black eyed pea soup in the Instant Pot, with collard greens, ham, andouille sausage and Cajun seasoning. No need to presoak the peas. A good luck New Year's Day meal and perfect all soup season long. Heat the olive oil on saute setting until hot. Add sausage and brown for a few minutes, remove to plate. Add celery, carrots, onion and green pepper, cook and stir a few minutes until starting to soften. Add garlic and cook about 30 seconds until fragrant. Turn off saute feature. Add bay leaf and Cajun seasoning and stir to combine. Add black eyed peas to the pot along with the reserved sausage and ham shanks (and small ham hock, if using). Add water, careful not to go over the maximum fill line. Gently stir to combine. Place chopped collard greens on top, pushing down to submerge. Seal and cook under high pressure for 20 minutes. When finished, let pressure release naturally for 15 minutes or so. Open and remove ham shanks. Shred meat and return to pot. (If you used a ham hock, remove and discard.) Taste for salt and pepper. Ladle into bowls and serve with hot sauce and cornbread, just my suggestion. Enjoy and may this soup bring you much good luck! I also added a small ham hock, for flavor, not any meat, that's from the ham shanks. It is totally optional, if you have one handy, toss it in. If not, no worries! “I Gotta Feeling” that you’re going to love this soup.